If you do not have Javascipt enabled, you will not be able to properly view this page. Our adhesive mats, roll mops and cuff sealers offer effective contamination control for maintaining critical clean areas. Over the years Markel has supplied adhesive floor mats to some of the largest distributors of industrial products in the world, including Fisher Scientific, 3M, VWR Scientific and Lab Safety Supply. In addition, Markel has supplied mats to many end users, including Motorola, Digital, and IBM. Markel has designed and produced a variety of mat-related products for the aerospace, nuclear and automotive industries. We specialize in creating special application products which are otherwise difficult for our customers to obtain. To make the best possible product, Mark focused his efforts solely on floormats and only on the manufacturing and production process. His goal was to let other companies with sales experience sell the product while Markel concentrated on research, development and support services. The Trim Tack® Clean Room Mats are available for applications where either frequent lifting of the mat for cleaning is required, or for use in areas where the mat's backing is unable to adhere to the flooring, such as carpeting. The Trim Tack® Mat in itself does not require the use of a frame. 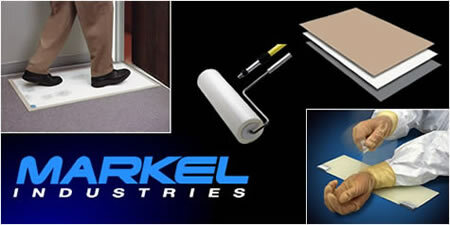 Markel Industries offers this product as an option for our customers who have special applications requiring a frame. Trim Tack® Floor Mats prevent contamination and particulate matter from entering controlled working environments. Fast, effective, and easy to use, each mat is composed of multiple layers of tough, polyethylene film, laminated together into a stack. 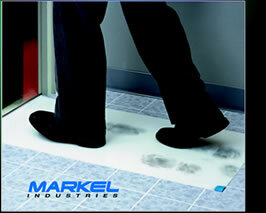 Markel Peel Off Mats was designed as a cost effective alternative to the Trim Tack® Mat Frame. Trim Tack® Sticky Mats are a new, flexible, poly film disposable fastening device used to effectively seal the area between the glove and the garment. The flexibility of the Trim Tack® Cuff Sealer allows easy donning for different size arms, keeping a snug fit and preventing not only particulate migration, but also infiltration of chemical product. Trim Tack/Markel Industries was established in 1982 by Mark Lussier. After many years in the high tech sales market, Mark saw a need for an adhesive floor mat that was of a higher quality than anything being produced at the time. Convenient to use, the Trim Tack® Contamination Control Mats are quick and effective at removing various contaminating particles from floors, ceilings, walls, tabletops and other surfaces. The concept is similar to the common paint roller; a roller handle with a cover. The cover in this case is a roll of adhesive coated substrate that has removable sheets similar to a Trim Tack® adhesive floor mat. Trim Tack® Track Mats are very easy to use; just roll the area to be cleaned as if you were painting the wall. When the roll becomes too soiled to pick up any more contaminants, simply peel off the soiled layer and tear off at the perforations to expose a new sheet of adhesive film. Trim Tack® Tack Surface Mats have 40 clean adhesive coated sheets (51/4"x71/4") with exclusive alternating color tabs. The pad is secured to flat work surfaces with a removable adhesive on back. The pad is used to remove contaminants from gloves and hands, and is also perfect for securing small parts during assembly or dismantling. Custom sizes are available.